Day 2- dried yeast is here. So I got here – to the day I knew was going to be my biggest challenge. So far, both the breads I have made have been edible and in the River Cottage book I seem to have found a method of working the dough which works for me. I was given a sourdough starter by a friend a year ago. He also gave me the recipe and method which he uses; that from the original Moro cookbook. I’ve heard people talk about the bread at Moro in reverential tones, so I was happy to start my sourdough journey with this. I have been looking after the starter for a year – it lives in the fridge (I was assured this was ok) and is fed every so often- more when I am using it. I have tried sourdough in the past but it hasn’t yet been edible. So when this bread began the starter was in pretty good shape and looked quite lively. This bread took 24 hours from start to finish. Thursday night I mixed flour, starter and water before bed. I left it in a warm, draft-free place; otherwise known as the utility room. When I got up on Friday the mixture was quite frisky and had bubbled. I then added flour and salt and mixed. The method suggests that you do this in a mixer as it is so wet. I left it to stand for ten minutes then mixed again for a couple of minutes. I then poured into two tins and left to rise. And that is when the fun began! The method says it would take 3-5 hours to rise about 1/3. I check in on it after three hours: no change. Four hours: no change. Five hours: a slight rise but only by a millimetres. I text Darren who gave me the starter to seek advice. He assures me a slow rise = a tastier loaf so I resist the urge to bin it. Six hours: I am cooking in the kitchen so decide to move it next to the oven. We have lift off. Nine and a half hours later and it is finally ready for the oven. They went in for thirty minutes at 230c, I then took them out of the tins and cooked for another fifteen minutes. Well they took so long that they only came out of the oven at bed time, so the bread was started on Thursday and finally tasted on Saturday! Both loaves looked the same- thick crust and well coloured. The taste is alright. It is nowhere near as tasty as sourdough which I have bought from the likes of More Artisan and it isn’t even as tasty as the other breads which I have made this week. 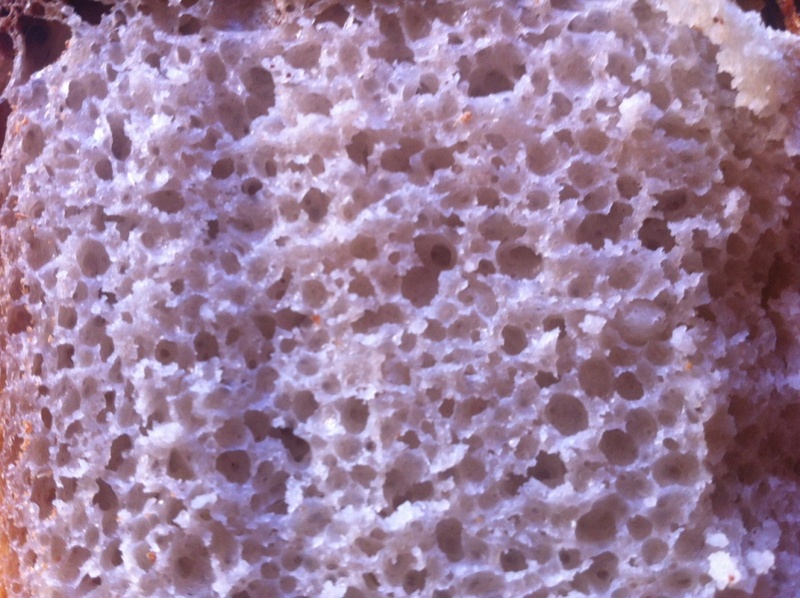 Inside, it has an even look which I would normally be pleased with but I know that sourdough should be uneven inside with large bubbles which just hasn’t occurred here. I am disappointed but not surprised. I knew when my loaves weren’t rising that my starter mustn’t have been active enough. We’re having friends round tonight and I was planning on serving this with a terrine as a starter. I am now unsure if I should inflict it on them or not? Done well, sourdough is such good bread, so I will persevere, give my starter more love and try different recipes (Dan Lepard’s name comes up again and again). I have really enjoyed this week, and it has done my bread-making confidence the world of good to tackle this kitchen demon head on. I’ve also come across some great bread makers on Twitter doing this who are trying to crack bread like me, or who are confident in their skills and happy to share. I found the Richard Bertinet method of working the dough difficult and messy, but the final bread tasted great. The River Cottage method seemed to come together much better than the Bertinet one, and again the results were good. Both these books have some really good, tasty looking bread recipes in them, so I plan to try many more, using (and improve upon my early attempts) the River Cottage method. In fact I am already looking at rye recipes for next week. 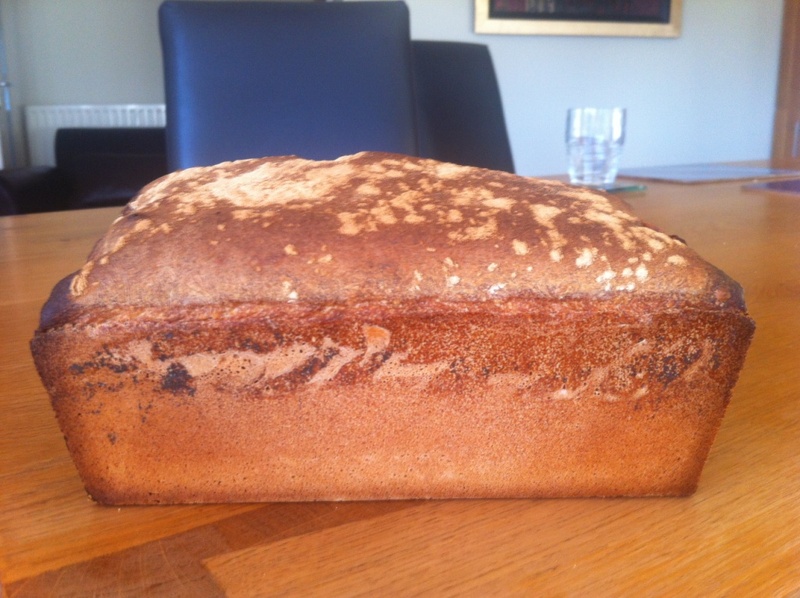 In terms of sourdough, again it is something which I will keep working at. As I said above, I will try and get my starter up to scratch and try different recipes. But if this week is anything to go by, I think that yeast is the way to go for me. Whilst I am not working, this is the perfect opportunity for me to spend time perfecting my loaves and at the same time hopefully saving us some money by making it myself. I won’t shy away from bread making any more, but seven loaves in one week is not good for the waistline so I will be leaving it a few days before I get the flour out again!